Dorothy Handland is claimed to be the oldest female convict to have sailed on the First Fleet and one of the most colourful. Arthur Bowes Smyth estimated Dorothy be 82 years old, but in Newgate Prison she was recorded as 60; another entry has her as 62, which is most likely correct. 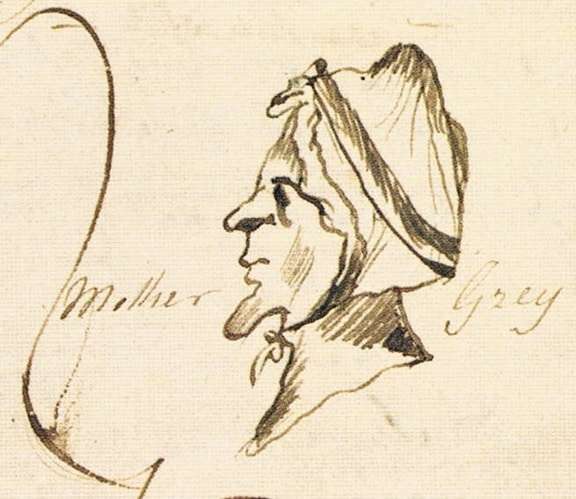 Bowes Smyth’s pen and ink side faced sketch of Mother Gray, depicts a woman with a very pointy nose and chin, wearing a bonnet. Shoemaker Robert Grey married Dorothy Coolley on 22 September 1766 at St Andrew Holborn. In February 1777 Robert and Dorothy, who had an old clothes shop in Saffron Hill, were at the Old Bailey for the trial of Sarah Tongue, who was convicted of stealing various items from them. The court found Tongue guilty, and sentenced her to three years imprisonment. Twelve years later in 1786, Dorothy was before the court at the Old Bailey, but under the surname of Handland. As an illiterate widow, she had married widower John Handland at Southwark St George the Martyr on 3 November 1781. At her trial, she told the court that Handland was living but they had separated and that she was a dealer in old cloths. On 2 November 1785 at about 9 o’clock in the evening Dorothy complained that she had been robbed, then on 5 November she charged William Till with robbing her. At the time Dorothy was a lodger of Till’s master William Beach. William Till was charged with stealing three line gowns (£5), a silk gown (40s), three pairs of sheets (50s) a silk cloak (20s), fourteen linen handkerchiefs (20s), nine years of three lace (40s) being the property of Dorothy Handland. Till was found not guilty before Mr Recorder, and he said there was strong grounds to suspect this woman with her confederates and he ordered her to be committed on the charge of subornation of perjury. Dorothy Handland, was indicted for wilful and corrupt perjury in her evidence on the trial of William Till, which began on Wednesday 22 February 1786, Mr Rose presiding. During the trial witnesses were called, one being Elizabeth Cohan, who was an acquaintance of sixteen years. Giving evidence she stated: I am an old clothes woman, I dealt with Mrs. Grey, that’s her name; I am a Jewess, I never deny being a Jew; so, she said to me, Bet Cohan, I have been robbed, William Till has robbed me of everything I have in the world, I have nothing but what I stand upright in; she told me this on the Friday morning, and she said nobody else could rob her, nobody else knew the way of the house; she said she would give me two guineas if I would go up to the house, and say I saw the man come out with a great bundle of clothes wrapped up in a sheet, and saw one or two gowns hanging out of the bundle. On Saturday the Sessions ended at the Old Bailey, after a continuance of ten days; when Dorothy Handland, for wilful and corrupt perjury as a prosecutrix of William Till at the last December Sessions, and attempting to procure false witness against him on a capital offence, was tried and found guilty : this trial was carried on by the City of London, at their expence, and lasted several hours : the court sentenced the prisoner to be transported seven years : the prisoner was an old cloaths-woman, well known in the metropolis, and lived in Leather-land. Dorothy Handland embarked on Lady Penrhyn on 6 January 1787. Her 7 years sentence spent in the colony were without incident. She had been living in a house under a Rock on the other side of the hill (today’s Miller’s Point area) with elderly convicts Joseph Owens (died 1790) and Henry Barnett who was ordered a passage back to England by the Governor in 1793. Sydney Cove June 1793, the Kitty transport was preparing for her homeward journey. On board the Kitty were embarked Assistant Surgeon Mr Dennis Considen, Lieutenant Stephen Donovan, Mr Richard Clarke, Mr Henry Phillips, five men (one being Henry Barnett) and Dorothy Handland (her term of transportation being expired was permitted to return to England). At the time of departure Dorothy was upwards or over eighty years of age, and had no concerns about weathering Cape Horn, wrote Collins. She had an uneventful voyage home and her arrival at Cork on 5 February 1794 was noted by the Navy Board as The Old Woman from Botany Bay. It is said she was the last of one of the toughest women of the First Fleet.